WHY Are Christians the 'Salt of the Earth'? Can you explain why Christ referred to His disciples as "salt"? Do you ever wonder what your specific purpose in life is? Do you sometimes have trouble figuring out exactly where you fit in the great scheme of things? Are there times when you simply don't feel useful or important to anyone, including yourself? If you are a Christian, you should have no such identity crisis. Jesus Christ bought and paid for us with His own blood. He even now owns and uses us, as we allow Him to. Christ tells us in His Word exactly who we are and what we are to be doing right now. In what is referred to as the Sermon on the Mount, Christ took His closest disciples to a secluded place on a mountainside and there personally taught them about their commission and the way of life that leads to true happiness. In the course of this teaching, Christ told the disciples (and us today): "Ye are the salt of the earth: but if the salt have lost his savour, wherewith shall it be salted? it is thenceforth good for nothing, but to be cast out, and to be trodden under foot of men" (Matt. 5:13). What did Christ mean, "Ye are the salt of the earth"? Why use, symbolically, this common seasoning? What can salt teach us about our Christian calling? Salt has several specific qualities that shed light on how we are to function as Christians. Salt occurs commonly in nature. About 14,000 uses are catalogued for salt, mostly in various industries. But only 3 percent of the world's salt is used in the home. Think of the small amount of salt you use to season a meal. Just a dash — a few grains makes a big difference. In Christ's day salt was not as available as it is now. Salt was once so valuable that it was used to pay the wages of Roman soldiers. We get the English word salary from this ancient practice of paying with salt. Salt was also used as payment in buying and selling Greek slaves; today people sometimes ask whether a person is "worth his salt" in evaluating him. The disciples would have understood the value and rarity of salt. So what did Christ mean when He called His disciples "salt"? Just this: God is not calling the whole world now, as Pastor General Herbert W. Armstrong has explained. "No man can come to me," Christ said, "except the Father which hath sent me draw him" (John 6:44). God is only working with a small group of people at this time. And God is only working with this "little flock" (Luke 12:32) to get a specific job done — preaching the Gospel of the coming Kingdom of God in all the world for a witness to all nations (Matt. 24:14). In other words, true Christians are rare. God's true people, in whom the Spirit of God resides (Rom. 8:9), are far fewer in number than this world's "Christianity" recognizes. Christians are basically sprinkled across the earth like you would sprinkle salt across food — sparingly. But what a difference they make in the world! So one thing we can learn from Christ's metaphor of salt is that our calling and commission are unique, important and highly valuable. It is a rare opportunity indeed to be called of God in this age. Salt, besides being used sparingly, is pure. Germs cannot live in it. The spiritual analogy should be clear: God's people are to be pure. According to Leviticus 2:13, salt was to be a part of all meat offerings. The salt, at least in part, was needed to symbolize that the sacrifice was pure. Today, Christians are to present themselves to God as living sacrifices (Rom. 12:1). We, as the "salt of the earth," are to be just as pure. If we are pure, the work we do is right (Prov. 21:8). Our very hearts should be pure (I Tim. 1:5), as should our consciences (I Tim. 3:9), our thoughts (Phil. 4:8) and our religion (Jas. 1:27). To be spiritually pure means to be unadulterated with the ways of this world, its philosophies, its ways of doing business, its wrong pursuits and desires. "There is a generation that are pure in their own eyes, and yet is not washed from their filthiness" (Prov. 30:12). If we are constantly repentant and striving to live God's way, we are washed from our impurities — our sins — by the blood of Christ (I John 1:7-9). We are to come out of this world (Rev. 18:4) and live our lives in total devotion to God. If we do, and endure to the end, we will be clothed with fine, clean, white linen — symbolic of righteousness or spiritual purity — at Christ's return. We will actually become members of the Family of God and the Bride of Christ (Rev. 19:8-9). After all, one of the first statements Christ made in this discussion with the disciples was, "Blessed are the pure in heart: for they shall see God" (Matt. 5:8). Probably the majority of us most commonly come in contact with salt as a condiment for our food. Think how salt, used properly, can add taste — and thereby pleasure — to a meal. The patriarch Job said: "Can that which is unsavoury be eaten without salt? or is there any taste in the white of an egg?" (Job 6:6). Salt, then, is symbolic as a spice or flavoring. Is your life as a Christian dull, tedious, a heavy burden, something bland and uneventful? It shouldn't be! Just as salt adds a wonderful dimension to the taste of food, the Christian life should be filled with interest, zip, hope and excitement. King David urged: "Let all those that put their trust in thee rejoice: let them ever shout for joy, because thou defendest them: let them also that love thy name be joyful in thee" (Ps. 5:11). It is difficult to be joyful in God, as this verse says, if you are always depressed, worried about your physical circumstances, living in the past or dwelling on the negative aspects of your life. David was constantly joyful and singing praises to God (Ps. 63:5, 81:1, 95:1-2). The apostle Paul was "exceeding joyful" even in the face of tremendous tribulations (II Cor. 7:4). Joy is, after all, one of the fruits of God's Holy Spirit (Gal. 5:22). If you are just enduring and not enjoying your life as a Christian, ask God for more of His Holy Spirit. Ask Him to let more of His joy flow through you and out to others. Develop your talents. Be as active as possible in fellowship with your brethren in God's Church and in service to everyone around you. It should be a pleasure to be around us as God's people. We, as the "salt of the earth," should be the most talented, positive, high-quality, "turned-on" people in the world. Just as salt gives a zest to food, we should have a powerful zest for life because we know our purpose and all we can accomplish. As Christians we are to set a good example for the world around us and announce the good news of God's government coming to earth. As we do, just as salt produces physical thirst, we produce in those around us a spiritual thirst. "And many people shall go and say, Come ye, and let us go up to the mountain of the Lord, to the house of the God of Jacob; and he will teach us of his ways, and we will walk in his paths: for out of Zion shall go forth the law, and the word of the Lord from Jerusalem" (Isa. 2:3). The world will be thirsting for God's truth with a thirst that we, in part, like salt, will have helped create. Then Christ can quench that thirst with the "rivers of living water" of the Holy Spirit, when the Holy Spirit is offered to the world at large for the first time (John 7:38). What about right now? Is your example making people around you view God's way positively? Are you creating in them a thirst for more of God's knowledge? Or do they look at you and say, "If that's Christianity, I want no part of it!"? A major use of salt is as a preservative. For example, where refrigeration is not available, meat can be salted to retard spoilage. Salt can also be used in tanning hides or in pickling foods. Salt in the Old Testament offerings (Lev. 2:13), besides picturing purity, symbolized that Israel's agreements with God were to be enduring. Salt also preserves life. Animals will travel long distances and risk danger to lick salt from natural deposits. Salt is necessary for the health of human beings, too. If our blood and body cells didn't contain a small amount of salt, we would die. Can you see the analogy? As Christians we have a vital role in preserving life on this earth. How? Notice Matthew 24:21-22. Describing the horrible time just ahead now, this passage says: "For then shall be great tribulation, such as was not since the beginning of the world to this time, no, nor ever shall be. And except those days should be shortened, there should no flesh be saved: but for the elect's sake those days shall be shortened." If not for a group of truly converted, faithful servants of God on this earth, God would have no reason to save mankind alive from the coming holocaust! True Christians are that group. Our job as the "salt of the earth" in this age is far more awesome than you may have realized. Salt has other uses, and we could draw other spiritual analogies from Christ's statement in Matthew 5:13. As an essential article of diet, salt historically symbolized hospitality. Christians should be the world's most hospitable people. The Old Testament uses the phrase "covenant of salt" (Num. 18:19, II Chron. 13:5). This phrase described an unbreakable alliance between friends. The covenant we made with God at baptism should be "of salt" — unbreakable. And we have the privilege of considering God our friend. Don't just read over the information in your Bible. God went to great lengths to produce and preserve this book for us today, and it is rich with spiritual truth. Look at all the meaning in just this one verse, Matthew 5:13. Examine the words in the Bible and make sure you know their definitions. Put all the scriptures on any one subject together to get the full implications. Meditate on what you read and ask God to give you more understanding of His Word. The Bible is "able to make thee wise unto salvation" (II Tim. 3:15). Really study God's Word! It tells you who you are and what you are to be doing. Grow in grace and knowledge of God's truth, and truly become the "salt of the earth"! How Does Salt Lose Its Savor? "Ye are the salt of the earth: but if the salt have lost his savour, wherewith shall it be salted? it is thenceforth good for nothing, but to be cast out, and to be trodden under foot of men" (Matt. 5:13). Salt without any flavor is, indeed, good for little. But how does salt lose its savor? And what does this warning mean to Christians? Salt is an enduring mineral. It can last a long time and undergo a lot of pressure before its quality diminishes. The deposits in salt mines, from which man obtains most of the salt used in the world, are thousands of years old. Yet the savor or taste is still there. Even refined salt can be stored for extended periods and retain its flavor. Though the salt may grow hard or lumpy, its "salty" quality remains. Salt cannot spoil. Dissolved in water, salt disappears, but its quality remains. Taste the water and you'll find that the salt is still there. Salt can also be subjected to extreme temperature. Even at 800 degrees Centigrade, the temperature at which it melts, salt still retains its particular chemical composition. So how can the savor of salt be compromised or destroyed? Only if it reacts chemically with some other substance — if it is, so to speak, contaminated by some outside influence. The salt used in Christ's day was often natural rock salt. This salt, when exposed to the rain, sun and air, could lose its saltiness. But the salt that was close to the rock remained protected and retained its savor. Can you see the implication for Christ's followers? Jesus said that though we must be in the world, we are not to be of the world (John 17:15-16). Consider this strong warning in Revelation 18:4: "Come out of her, my people, that ye be not partakers of her sins, and that ye receive not of her plagues." Choked by "the cares of this world, and the deceitfulness of riches, and the lusts of other things entering in," Christians can become unfruitful (Mark 4:19). As the "salt of the earth," we can lose our savor, and are thereafter "neither fit for the land, nor yet for the dunghill" (Luke 14:35). Have you known members of God's Church who "lost their savor" and left the Body of Christ because they allowed themselves to be contaminated by this world? Perhaps they became obsessed with making money. Maybe they let the trials in their Christian lives overwhelm them. Or maybe they listened to the arguments and attacks of dissidents and detractors, and decided this was not God's Church. What about you? What concerns you the most? Is it your job, family troubles, the broken-down home you live in, the desire to be married, your loneliness or an endless list of things you would like to acquire for yourself? Or is it the high calling of Jesus Christ, His end-time Work and your part in it and developing the perfect, holy, righteous character that pleases God? If you are concerned most with anything other than the items in this latter list, stop and examine yourself. Get back on the track quickly. 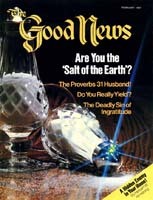 You are the "salt of the earth," but salt can lose its savor through contamination from outside influences. God wants you to obey Him and be in His Kingdom. That's why you were created. Nothing else matters. Nothing else will make you happy. Be the "salt of the earth" — and don't lose your savor!